Vivo released its most beautifully designed smartphone offering in the form of Vivo Nex. The Vivo flagship device packs top-notch hardware and flaunts an innovative design. Vivo has been working on 5G technology for a quite a while. The Chinese handset maker is planning to launch 5G smartphones soon. In a picture posted on Slashleaks, a 5G version of the premium Vivo Nex device can be seen. The device is still in the developmental phase. The company is working on the 5G devices at a neck-break speed. According to sources, the company is planning to launch its first 5G smartphone by 2020. While many smartphone makers are rushing to work on releasing phones with 5G support. Lenovo Vice President Chang Cheng confirmed in a post on Weibo that Lenovo will be the first company to launch a 5G smartphone powered by the new Snapdragon 855 SoC. We can expect the device to arrive by early 2019. The Vivo NEX smartphone flaunts a 6.59-inch Super AMOLED Ultra Full-View display with 1080 x 2316 Full HD+ resolution and an aspect ratio of 19.3:9. The device comes with an in-display fingerprint sensor and comes with an impressive screen-to-body ratio of 91.24 %. Under the hood, the device is powered by an octa-core 10nm Qualcomm Snapdragon 845 chipset clocked at 2.7 GHz combined with an Adreno 630 GPU. The CPU architecture is Kyro 385. The storage model launched in India brings 8GB of RAM paired with 128GB of onboard storage. Unfortunately, it does not come with an option to expand the memory further. In the imaging department, the Vivo NEX features a 12 MP + 5 MP dual-camera setup with 4-axis optical image stabilization. The camera unit on the device can shoot videos in 4K resolution. On the front, the smartphone comes with an 8MP pop-up selfie camera module with a f/2.0 aperture. Whenever you need to take selfies or need the front camera unit for video-calling, the innovatively designed module elevates in a fraction of seconds. The front-camera module can also be summoned for using the Face Unlock feature. Keeping the lights on is a large 4,000mAh capacity battery that comes with Fast Charging technology. The Vivo Nex also includes a dedicated AI button that can help you access AI services like Google Lens, Google Assistant, as well as the device’s AI Engine. The connectivity options that tag along with the Vivo Nex smartphone include Wi-Fi 802.11 a/b/g/n/ac dual-band, Bluetooth 5.0 Low Energy, GPS with A-GPS, GLONASS, BeiDou, USB Type-C, and 4G VoLTE. On the software front, the Vivo Nex will ship with the Android 8.1 Oreo-based Funtouch OS 4.0 out of the box. The device measures 162 x 77 x 8mm and weighs in at 199 grams. The Vivo Nex is currently available with a price ticket of Rs. 44,990 and is available in black color. You can get the device through Amazon and the company’s own e-store. Vivo has launched multiple devices this year. The company’s Vivo NEX UD A and Vivo NEX UD have received certification from China’s Ministry of Industry and Information Technology earlier this week. 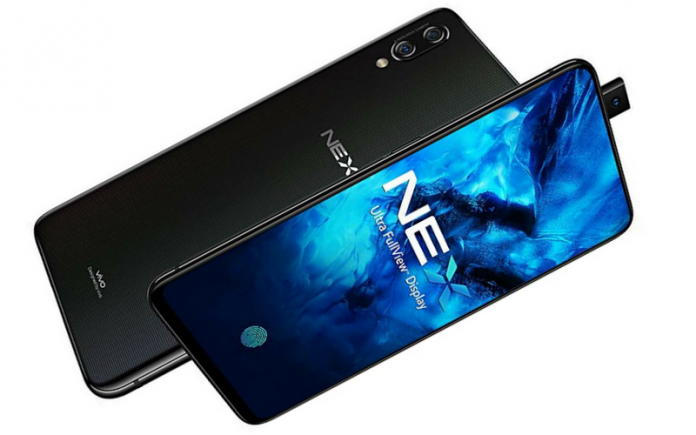 The term ‘UD’ in the newly CMIIT certified Vivo NEX UD A hints that the company could be prepping up a NEX A device that comes with an in-display fingerprint scanner. The device is likely to feature an optical sensor instead of an ultrasonic reader in order to save costs. However, there will be a Super AMOLED panel that makes up for it. Unlike the Vivo NEX S, the NEX A is targetting those who do not want to spend money on flagship-grade smartphones but can still have the taste of premium devices.